1 Granny Smith apple, peeled, cored, cut into 1/4 inch dice Peel and chop the apple or, if you wish, leave the peel on and cut slices. Preheat oven to 450°. Coat a 12 or 14-inch pizza pan with cooking spray. Scrub potatoes with vegetable brush under cold running water. Peel. Cut into ¼-inch thick slices. Place in large saucepan and add cold water to cover. Over high heat, bring to boiling. Reduce heat to medium. Cover and simmer until potatoes are tender but still hold their shape, about 7 to 8 minutes. Drain. Rinse under cold water and drain again. Stretch the pizza dough to fit the prepared pizza pan. Arrange potato slices in a single layer on the dough, starting from the outside edge. Sprinkle with cheese and ¼ teaspoon of the salt. Top with prosciutto, apple and jalapeño. Drizzle with 4 teaspoons of the oil. Bake 20 minutes or until edges of crust are golden brown. Remove from the oven. 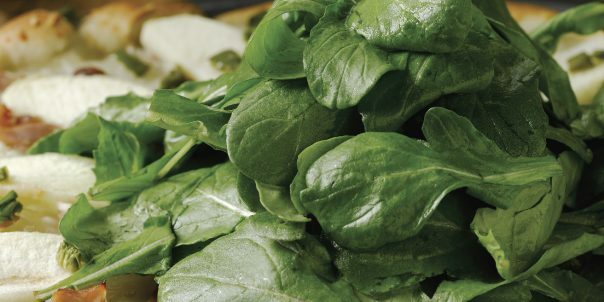 Toss arugula with the remaining 2 teaspoons oil, 1/8 teaspoon salt and lemon juice. Top pizza with arugula. Cut into 6 wedges and serve. Nutritional Analysis per serving: 290 calories, 9 g protein, 49 g carbohydrates, 9 g fat (25% of calories from fat), 5 mg cholesterol, 3 g fiber, 541 mg sodium.